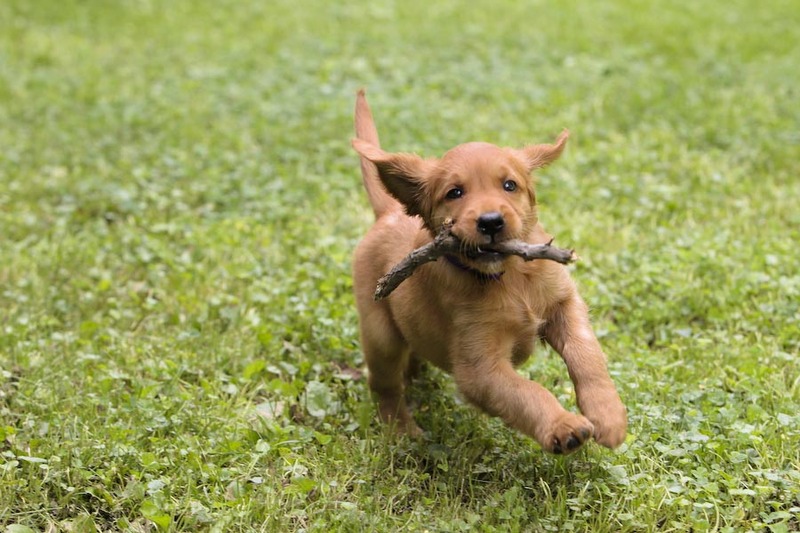 a picture and tell us what makes your pup so special to you! 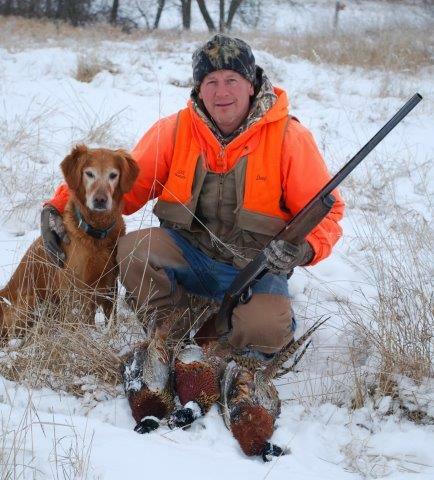 We shot 101 pheasants over this dog this season. 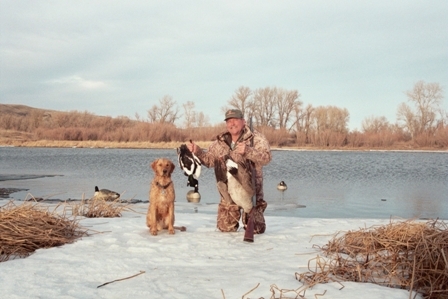 We hunted one or two hunters, all wild birds, all public-accessible lands. I didn't think it was possible to kill a hundred, our season goal is always 50. 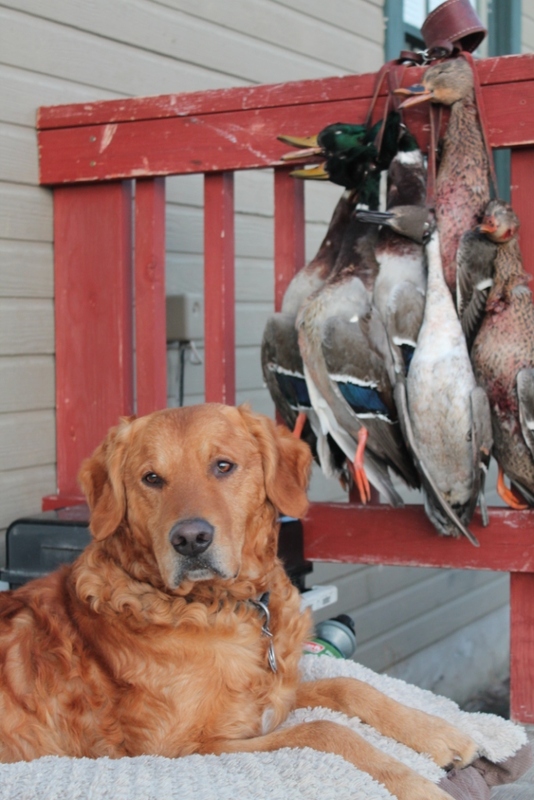 So many fabulous retrieves on birds that would have been lost with a lesser dog. She's incredibly relentless searching the cover; I see the field trial genes every day. Maci never quits in the field. 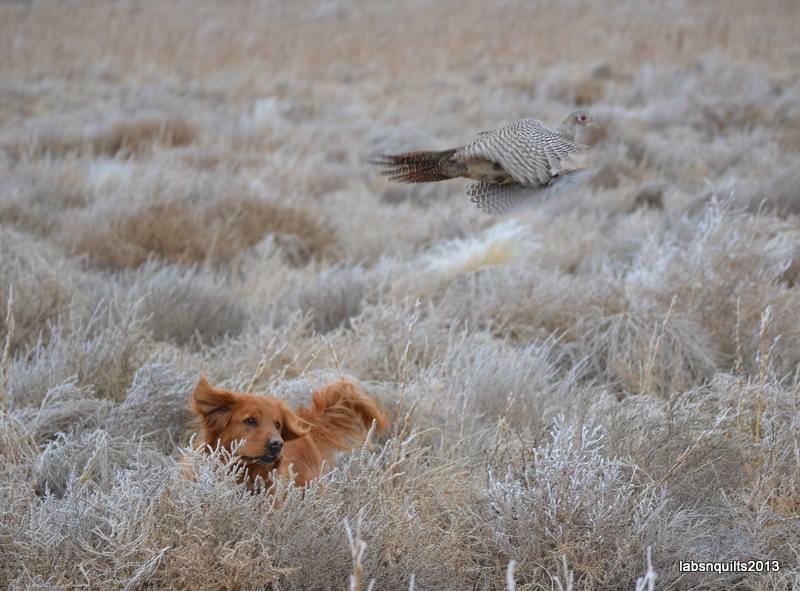 Quite the pheasant dog. Hope all is well with you, and that you have had a fine autumn. 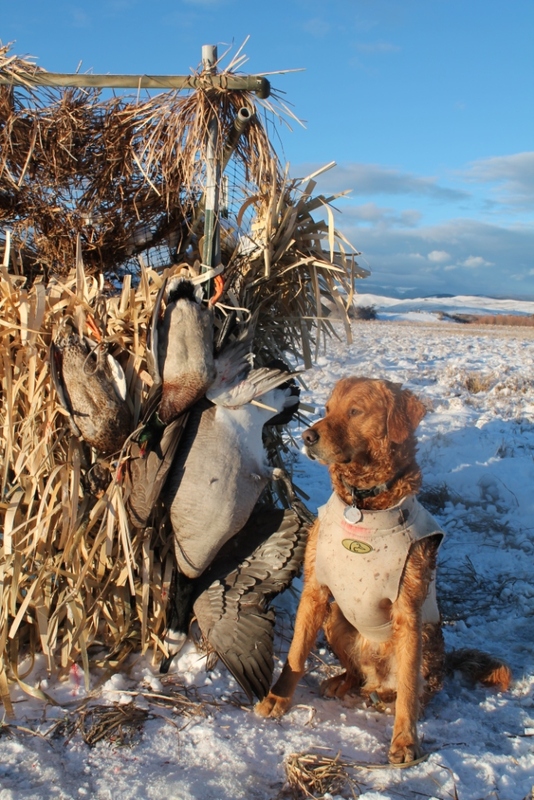 Had planned to be over there last weekend, but snowstorm changed my plans – went to Loma for quick goose hunt instead. Teal and I have been having some good time hunting, enjoying this last year at the bunkhouse before I retire later this summer. Have been there 20 years – quite a chapter of life. Teal is healthy and happy – I consider us both in our prime, and doing our best to enjoy every moment. Right now, I am thinking that an excellent symbolic first day of retirement is September 1, the beginning of a new season, so that is the mark on the calendar. Hope you and your family enjoy excellent Christmas holidays, and I’ll look forward to visiting with you as soon as I can get over to Lewistown. Scroll down to see previous entry. Just dropping you a note to say hi and update you on Tana, (Annie and Finn 2010 litter). 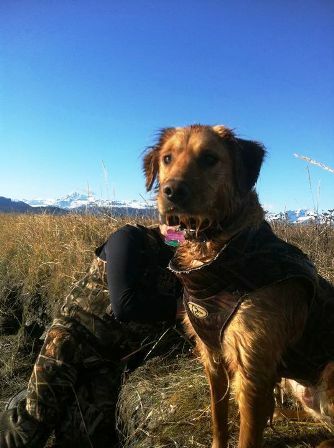 Tana is still doing great and is a pleasure for us as both a hard charging hunting retriever and also as our number one companion and house dog. 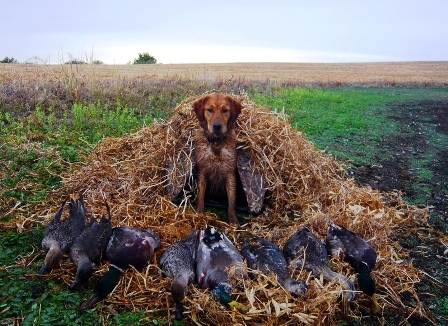 Tana has really come into her own in the field this year working and retrieving birds. 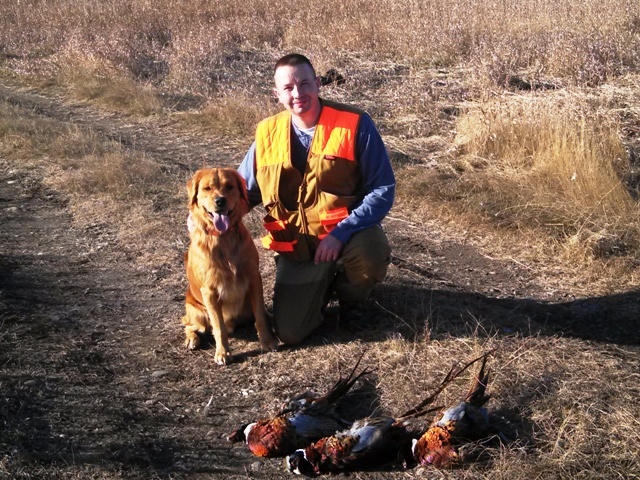 We were able to get out upland bird hunting quite a few times this year in both ND and SD. I have attached a few photos of her from the field this year. Have a great holiday season! Thanks for breeding such great dogs! Hope things are going well. You and Doug must be very busy as it looks like your golden family continues to grow. Just thought I would give you a quick update on Stella... Hard to believe we just celebrated her 5th birthday in October. 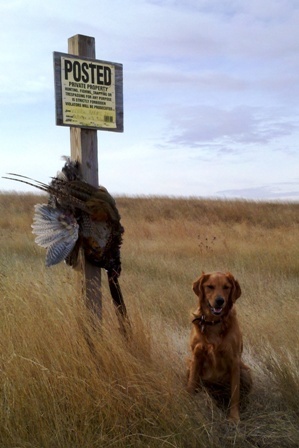 We continued with a few more hunt tests again this summer and she did great. She had 5 more master passes which puts her at a total of 10. This included 2 passes out in Toronto, Ontario. I was out there for work and there just happened to be a hunt test so I put her on the plane with me. We also dabbled in the field trial world this summer as there were a couple close to home. She had an incredible 3rd place finish in the qualifying against a field of 21 other dogs. Most of these dogs that are competing are receiving intense pro training year round so we were very impressed that Stella could keep up with them - mostly all black labs. She also earned a "ribbon of merit" (essentially 5th place) in another trial. The two trials were fun but we still very much enjoy the hunt tests and will continue again next summer. 5 more master passes and she will have her Grand Master title. 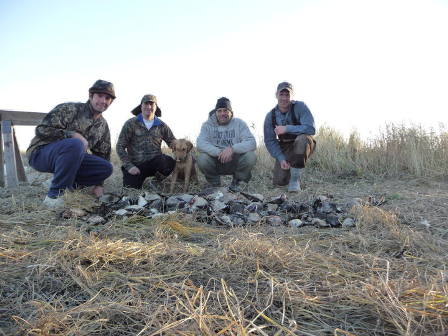 Once the tests/trials were done we quickly transitioned to hunting in September. 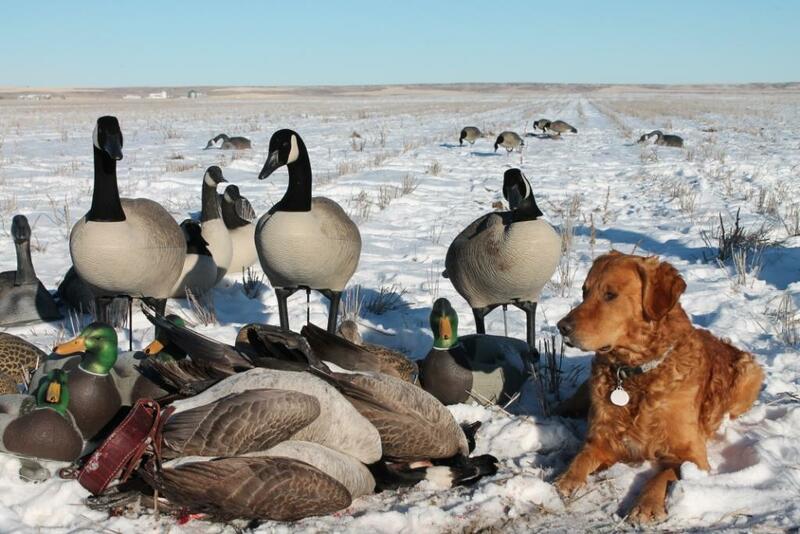 We had another incredible duck/goose season with Stella getting over 250 retrieves again. I've attached one of my favorite pictures from this season. As intense and energetic as she is in the field, she's still amazingly calm at home and continues to be so good with our two year old daughter. We have another child on the way in March so Stella will have to adjust again but we know she'll be fine. 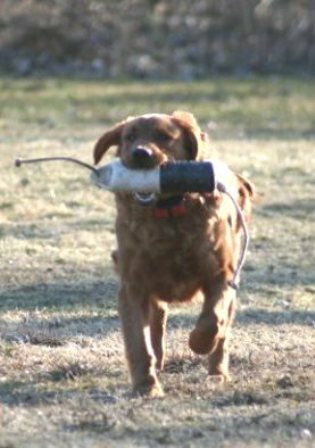 I keep in touch with Maunty Karp from Ringneck Kennels who helped train Stella and it sounds like he trained another couple Saturday Night pups this year and continues to really appreciate your breedings. 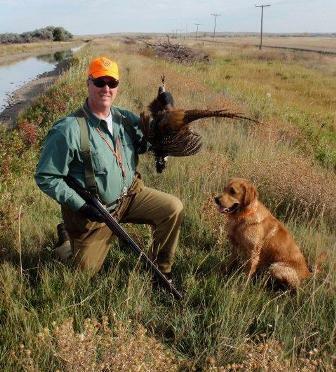 He always comments that your pups just have an overwhelming desire to really hunt. So many of the field labs these days are bred to be like robots but often lack the natural desire to hunt. Hope you and Doug have a Merry Christmas!! Dawson is now a year old and I wanted to give you an update. He is simply such a fabulous dog! Dawson has such a zest for life and loves to learn and explore. Training Dawson is so much fun because he has a strong work ethic and catches on very quickly. I have started training him in agility and tracking and his athleticism and intelligence are very evident - all his teachers love working with us because he's so smart and eager to work. And, even though Dawson has a high energy level, he is able to switch it off when needed. Dawson also has such a great personality and is funny, charming and very sweet. 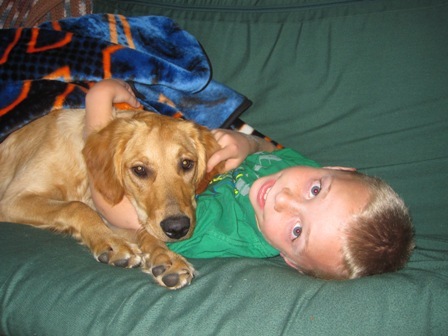 He and Grady are best buddies and love to play together. I could go on and on about how wonderful a dog Dawson is. He is a delight and such a joy to have! I hope this finds you well and you are enjoying the hunting season. I’m sure you have been on the weather roller coaster much like we have been in Colorado. I wanted to touch base and tell what an amazing dog Earl has turned out to be! He just had his 4th birthday….hard to believe. 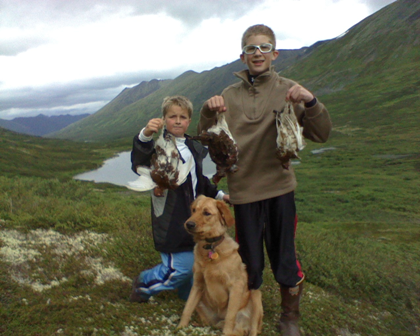 I attached a photo from a successful hunting trip this past weekend with my son. Earl is from Lily and Finn. He has the absolute perfect build for an field Golden! He has an incredible nose and unbelievable drive to hunt all day. Plus he is one of the sweetest things on earth. The good old saying “Man’s best friend”. One of these days Sue and I would love to stop by your place and say hi. Ruby at work Flushing a hen - such a stylish girl! I am long overdue to give you an update on Ruby. 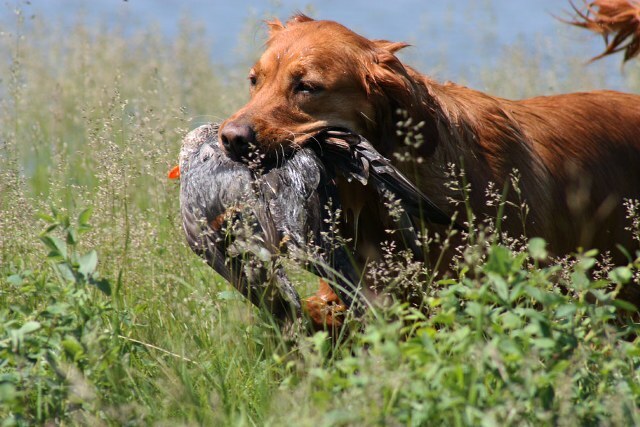 She has turned out to be an outstanding bird dog as well as a great family dog. 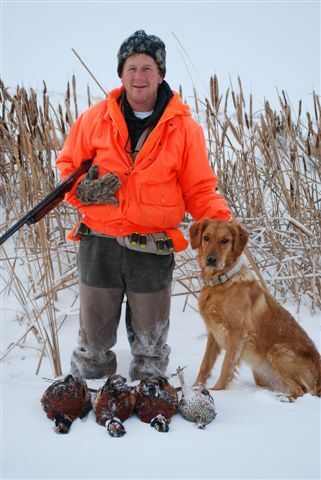 I've attached a couple photos from one of last year's pheasant trips. She has a tremendous nose and has found plenty of birds that other dogs have missed. She hunts hard and really loves the sport. It turns out that she is a great fishing companion as well! Our son Jake is as impressed with Ruby as I am, and that's why he contacted you about a puppy. 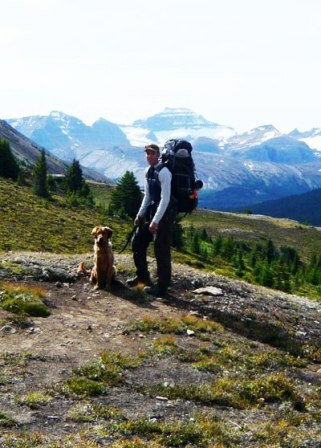 He and I usually hunt together although last weekend he took Ruby on a grouse hunting trip. I suggested he give you a call. It is hard to believe Gracie turned one year old on April 30, 2014. Saturday Night Amazing Grace II, what a girl! At one year of age she has already engrained memories that will be with me forever. 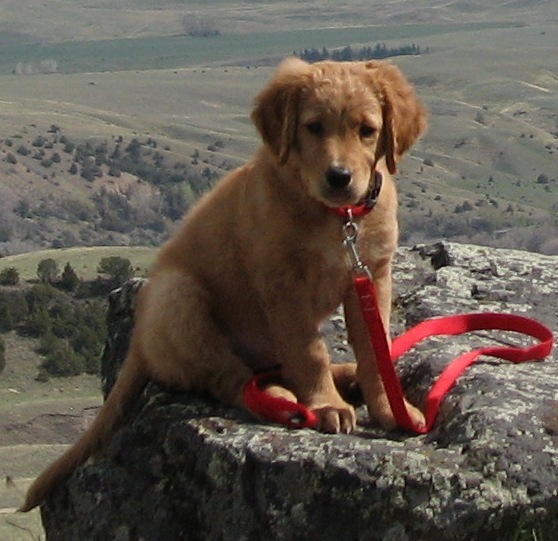 I remember searching the internet looking for a breeder, in Montana specifically, looking for quality and care. 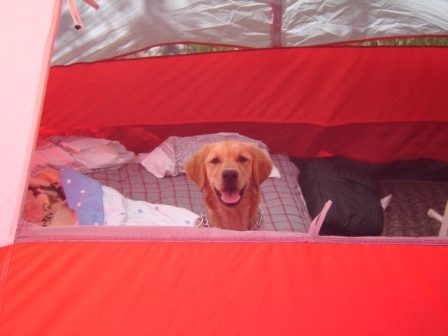 At that time my best friend was ten with a lot of health problems and I knew I did not want to be without a golden. At the same time I didn't want to let go. Jill, you were so patient and willing to listen to me both by phone and email as I shared my feelings, my story and pictures of our goldens. 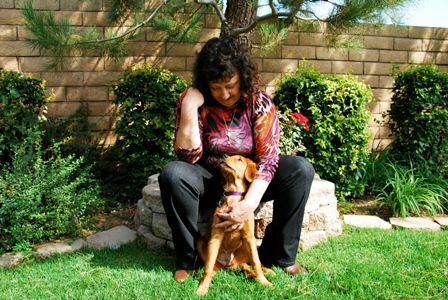 Your compassion as a person and as a breeder spoke volumes. I enjoyed watching your web page as puppies were born and placed with their new families. I knew that while you were nearly 2,000 miles from Houston, Bill and I had found the right breeder, when I was ready. One and half years later it was time to reach out to you and wouldn't you know?! Babe and Lucky had a litter that would be born in April 2013. You were kind enough to allow Bill and me to visit you and Doug and meet the proud Dam, Sire and pups in May. It was great to meet all of your goldens and to see your kennel. Never before had Bill and I seen such a flawlessly clean kennel or such happy and content goldens. 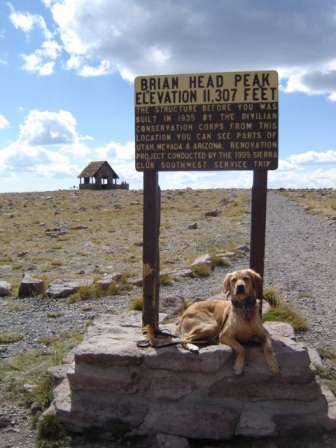 In June 2013 we flew back to Montana to bring Gracie home to Texas. She stole my heart and began to amaze me from the get go. I learned from my previous golden that they will intuitively speak to you and know your next step before you do but never had I expected that from a puppy! Gracie is so very intelligent. She knows when it is time to kennel up and go to work. She began going to the bank with me at 9 weeks of age. She continues to go with me daily and bank customers love her. 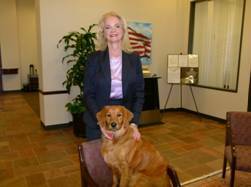 She is calming to my soul and brings joy and laughter to bank customers and employees. She wasn't kenneled for long. She kind of owns the bank and wanders around enjoying every moment. She loves the birds! You should see her run to round up doves or pigeons (or whatever birds are on the ground) running in circles not letting them land. It's a shame Bill can't shoot in the city! She is so driven to please at such an early age. She loves the water and loves jumping in the water to retrieve her frisbee or ring. You should see her when I come home. Here I am in my banker gear pulling up to the house. When I open the door to let Gracie out she jumps out the SUV and runs to the pool, jumps in and begins splashing, playing, looking at me like, hey, throw my toys to me! You can't help but laugh and unwind. She makes my day every day. She loves to explore and loves our walks. We were worried about bringing a new puppy into our lives having a 12 year old golden who had back surgery a few years ago. We knew he missed his best friend too and we didn't know how it would go over bringing a rambunctious puppy into the equation. For awhile he looked at her like, really? But, he quickly began to teach Gracie puppy manners and we firmly believe that Gracie has added quality of life and years to his life. At 13 Beau plays again and Gracie knows to be gentle. She has never disrespected his health. Gracie is funny. She won't eat until Beau has eaten; she then wants to eat out of his bowl. She loves Beau. It's very sweet to see these two together. Gracie is a lover and great companion; she is very content and happy. People that have never seen a dog smile and laugh are missing something. She makes me smile and laugh all of the time and I am so grateful to have been given a second opportunity to own a special golden. 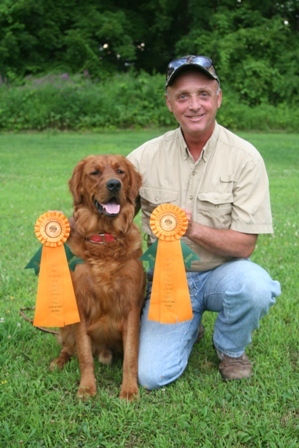 Bill told me a long long time ago that I was in for the treat of a lifetime owning my first golden. Boy, was he right! The look of adoration and love is sometimes overwhelming. There is not one word to describe Gracie. She has so many positive attributes; smart, funny, caring, driven, loving. That's my girl. Jill, I never intended for this letter to be so long. In closing, I must say, I am also so very blessed to have met you and Doug. From the first time we met you both, I felt an instant bond and I felt like we had known each other for many years. Thank you from the bottom of my heart. We wanted to send you a letter to let you know how happy we are with Remi. He is a great companion to us. He has been with us for almost a year and a half and we have enjoyed every minute of it. He is very intelligent and has got quite the personality on him that continues to make us laugh. Sometimes, we think he is too smart for his own good! He is great around the house and even better in the field. Training has been easy and he is always ready to learn something new. This year was our first hunting season and we had great year. It’s hard to believe that for as young as he is, how well he is doing. I can tell you that he works really hard in the field. 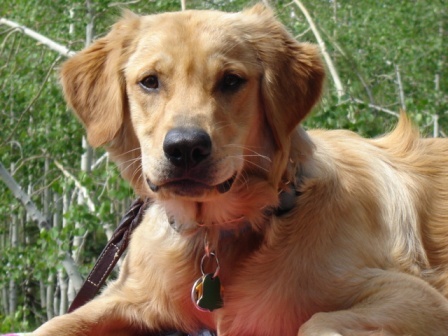 He has a strong nose, retrieves naturally, has a soft mouth, and is very light and quick on his feet. 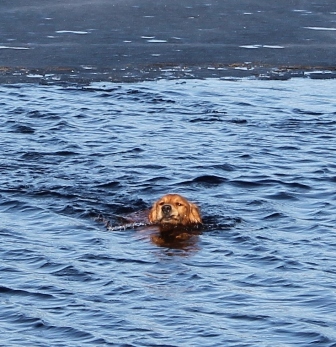 Additionally, he really loves the water and is a natural swimmer. He is going to be quite special when he hits his prime. We truly enjoy his company and are looking forward to many years with him. Gracie's early retrieves at 2 months 11/13 - Two year old Gracie after a good day in the field. I thought it was about time for a Gracie update. I see you just sent a litter to their new homes and Kate has a litter coming up. I'm happy to see Kate having another litter - she produces exceptional pups!! On to Gracie. Gracie is doing great and we are enjoying our time together. We always say that Gracie has to be the happiest dog we have ever known. With this being hunting season she is even happier than usual - if possible. It's a good thing that I like a dog who likes to stay very close because Gracie is very much a lap dog. She is typically on my lap whenever I'm sitting on the sofa, often upside down on her back. She listens extremely well, and has an amazing understanding of the English language. We are now into Gracie's second hunting season. While our bird numbers are still way down, Gracie will find them if they exist. She hunts very hard and covers a lot of ground. When she goes through cover, she sometimes appears to have springs on her feet. She really works a nice pattern and doesn't stray too far away. I can make changes in direction and she will immediately adjust to the change. Her nose is exceptional and she will scent birds from an amazing distance. It's so much fun watching her work a "scent cone" right to the bird and knowing how close she is getting by her movements. Also, Gracie won't out run me when on a bird (each passing year that gets more important). season and up coming holidays. We brought Jack home in early August and by mid-November he had full run of the house, no puppy gates or anything. He was reliably housebroken after about two weeks with us (any mistakes were our fault). He loves his chew toys to this day but he never chewed anything that he shouldn’t (shoes, bags, kitties…). He is so cute with toys now; I pick them all up on Saturday morning when I vacuum the house and put them in his “toy box” and by Sunday evening they are all back on the floor. We live on a lake here in Maine and on Jack’s second day home, he was wading in the water and picking up twigs. His swimming progressed until the pond iced up, but it was “ice out” in mid April and Jack has been swimming every day since. He is the first dog I have ever had who will just jump into the pond and swim around for fun – I have to remind him to come out and warm up. 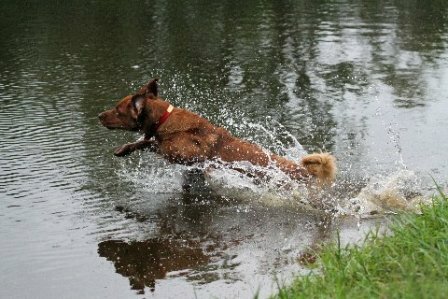 His favorite thing when not fetching balls is to splash with his front paws and try to catch the splashes with his mouth. 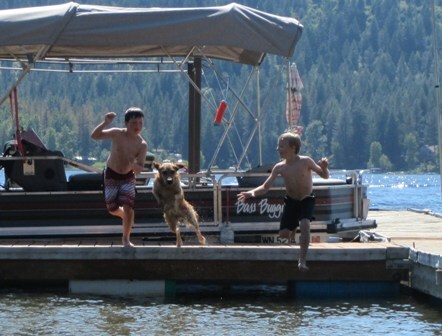 We have just started training for dock diving competitions and he is a fast learner – pretty much fearless about jumping into the water. Not only do we live on a lake, we are at the end of a mile-long dirt road – pretty much paradise for a dog and his companion. It is while we walk our road that I see what a talented field dog he is. 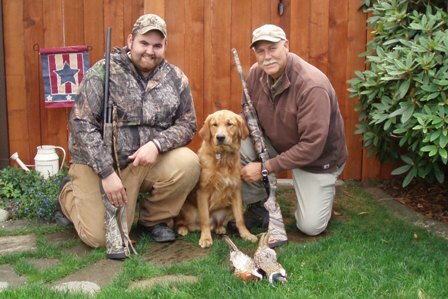 I never learned to hunt, but I tagged along with my Dad when he hunted with our first Golden. He would have been impressed by Jack. We have a lot of woodcock and partridge in the woods along the road. When Jack was a young pup, he just sort of crashed through the woods flushing anything he could find. Now, and I don’t know how he knows this, he semi-circles into the woods and then drives straight back flushing the birds right to me. I have probably deprived someone of a great field companion! 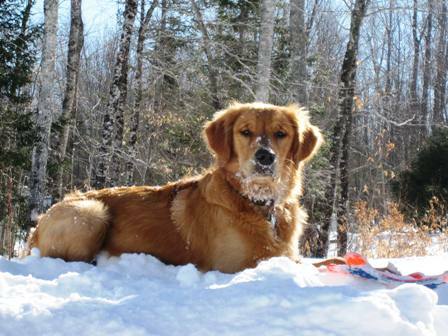 His nose is startling; he never lost a tennis ball in a snowbank. Whenever I thought he lost one, I would toss another which he would go get, bring it back to me as if to say “this is not the one” and then go back until he could find the other. He now also knows the names of five of his different toys and will retrieve the correct one if it tell him to FIND it (I think “find” is his favorite word!). I would also say that Jack is “field savvy”; he chases the mallard ducks that roost near our dock but he only barked and alerted me to the porcupine we saw on one of our hikes. I know this is already a lengthy letter, but I am just so over the moon about this dog. If anyone ever has any questions about the kinds of dogs that come from your kennel, please do not hesitate to give them my contact information. Jack is truly an intelligent, calm, athletic and loving dog. 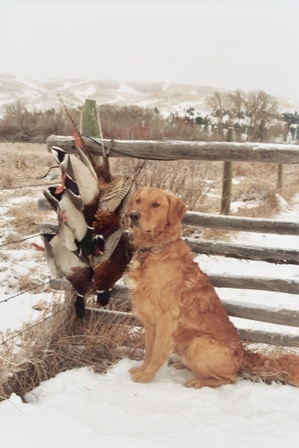 As we tell him, we hit the “Jack pot” with our solid gold retriever. Just over a year has gone by since I brought Ruckus (Annie & Finn Fall 2011) home to Virginia. I found myself reflecting about this other day as he and I sat side by side hunting ducks on a nearly frozen river in Pennsylvania. It’s weird as even though this is his first season it seems like we have a lifetime of amazing memories already! He is such a great dog in every way, such a part of the family and my best buddy for sure. I don’t go many places that he’s not right beside me riding shotgun, even if it’s just a short trip to the store for milk. I wanted to write this to say thank you, SNGR’s rock! When I found myself in the search for a puppy after I lost my 14 year old lab I was convinced that I was going back that route. 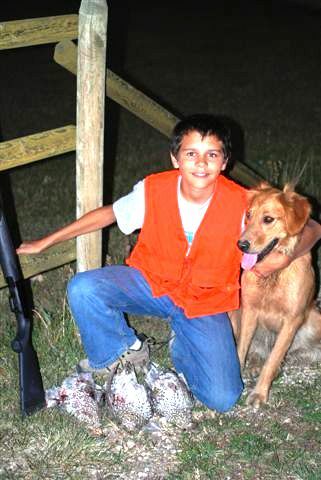 My girlfriend’s son kept asking me to get a Golden Retriever and I kept telling him that they just don’t hunt…boy was I wrong. We just don’t see this kind of dog out here very often. Honestly, I never saw one. Don’t get me wrong, the GR has a great reputation as a loving, gentle family dog but not so much a hunting dog. I started to search around, more for curiosity sake than anything else, about field bred Goldens and I was opened up to a new world! Almost all of these dogs were out west and the more I read and researched it became clear to me that I had to have one. Through my search I kept getting directed back to your web page. I went through every comment, photo, testimonial and video many times and kept getting the same feeling every time; I had to have one of your pups. Annie and Finn were the most current litter of pups that were to be available. This excited me greatly as I saw the awesome dogs they produced the first time around! Ruckus impressed as soon as I brought him home. At 7 weeks and 4 days he retrieved a hand- thrown pigeon (first ever bird) to hand. We all looked at each other like did that just happen? So we tried it again…boom right to hand! 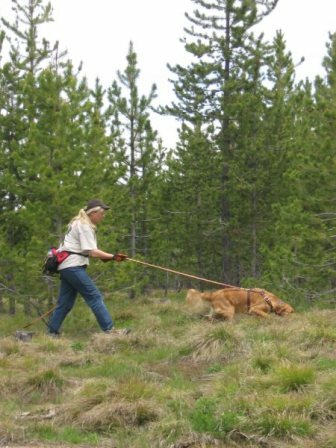 Since that day Ruckus has completed a field training program and retrieving program. His nose is amazing and his drive is unstoppable. He flushes so aggressively that he is typically airborne on the bird’s tail. Actually he flushes like a Springer! It’s something to see, a big red dog flying up out of the grass after a Rooster! 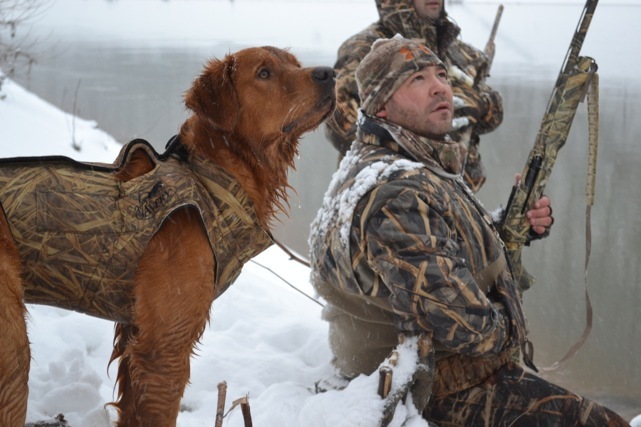 As amazing as he is in the field, he is equally at home in the duck and goose blind or on the boat. I have hunted this dog in every imaginable condition so far. From scorching hot to frozen subzero high water rivers; he never misses a beat. When work is over and we are back to the house he is just as calm as can be. He is the definition of a dog having the proverbial “on-off” switch. I could tell stories all day about our adventures but like the pictures to do the talking! If ever anybody would like to speak to me regarding my experience with one of your dogs, please never hesitate to share my contact information . I want to close with this. 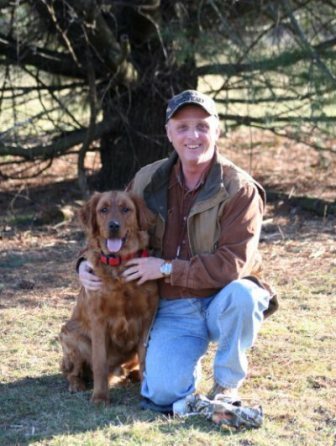 I am fortunate to have one of the very best field dog trainers and handlers in the States and Canada, possibly in the world living close to me. He has openly stated to myself and others many times over that you guys may be producing the best field GR’s in the country after training Ruckus. Coming from a guy who has seen it all and who makes his living off of training field champions that really says something!!! Keep it up and THANK YOU again!!! Matt, Kristen, Shane and Ruckus! We thought you would like to see what a wonderful boy Sky has turned out to be. We both feel so lucky to have found you and your beautiful goldens. My husband and I can't imagine life without him now. He has become my husband's shadow, and travels with us everywhere. Our Sky became a certified therapy and service dog at just 10 months. He is so smart, but we already knew that! His skills even got him a spot on the Salt Lake nightly news station. He's our rock star! Not a day passes, that someone doesn't remind us how lucky we are to have such a special treasure. I just can't tell you enough how much we love this puppy, and we thank you so much for the opportunity of having him in our lives. Just thought I would drop you a quick note. 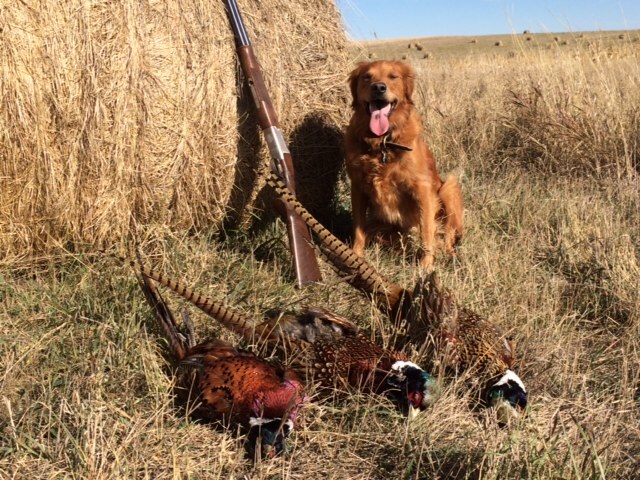 Tana and I have been doing a lot of pheasant hunting this fall so far and we have a few trips planned for December as well. 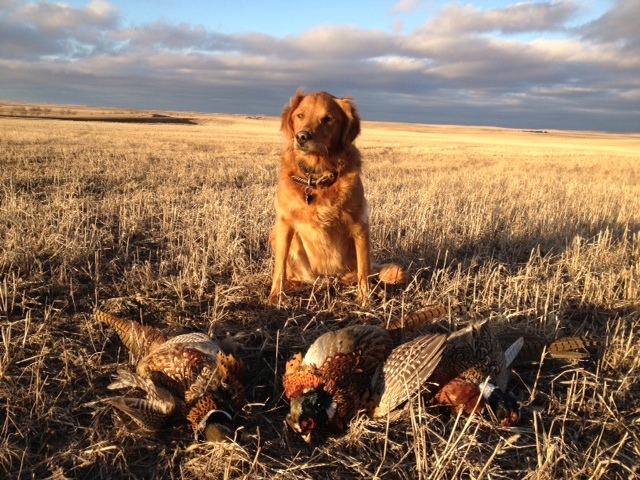 Tana is now 3 ½ years old and is doing an excellent job, we even got back to her home state near Wibaux and shot some birds. 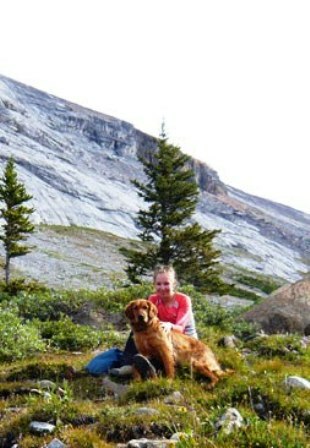 I took her with me to Bozeman elk hunting and she had a blast at camp, we also were up near Harlowton deer hunting. I attached a few pictures of her for you. Tana. Hope you enjoy the update, thanks for raising such quality dogs, you wouldn’t believe the compliments I get on Tana. Take care and have a good Thanksgiving. 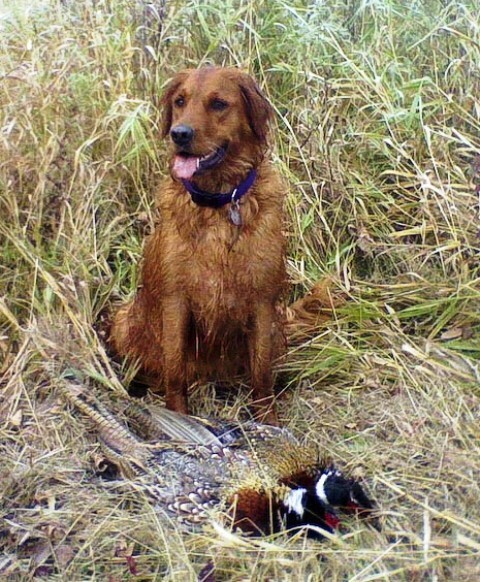 I thought I would send you this picture of Tana out at Hettinger ND for the pheasant opener this last weekend. 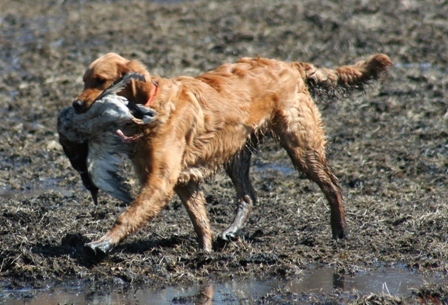 Tana is sure turning out to be an excellent bird dog, I have to remind myself she is only 15-16 months old! I also have some pictures of her from last year at 5 months old and hunting that I am trying to find to send you. She is really all we could want in a dog, she is great around the house as a family pet, and when we get into the field she is a strong hunter. So far I haven’t even had to use or think about using a shock collar on her, and I think that will be the case with her. Anyways just wanted to say hi and give you an update on Tana, she is doing great, and I am pretty sure the feeling is mutual as she is pretty spoiled around the house! I do check your website out now and again, it is fun to see the new litters etc. A buddy of mine is looking for a dog and I told him to check you guys out, I am sure he would be more than satisfied as I am. Well take care, I will try to send pictures once in awhile. 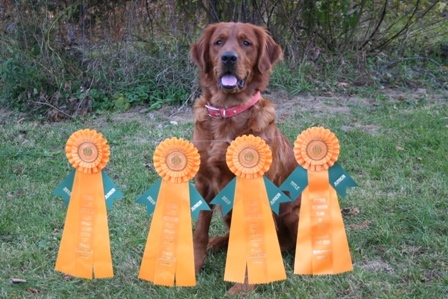 Proud Update Fall 2014 - Stella is now a Master Hunter! 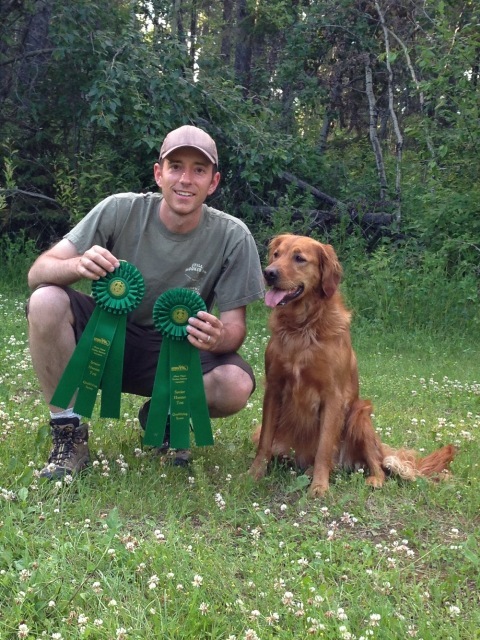 Congratulations to Nick & Sarah Hawkins and their good girl, Saturday Night Stella Marie SH for earning both her Canadian Senior Hunt Title and NARHA Working Dog Title this summer! Stella is a Lily & Finn puppy (Oct. 26, 2010) Good Job! 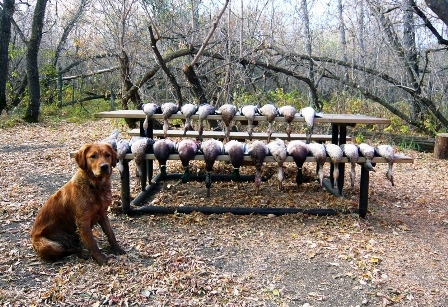 Thought I would give you another quick update on Stella... She had a very impressive run of hunt tests this summer. Her consistency was amazing!! 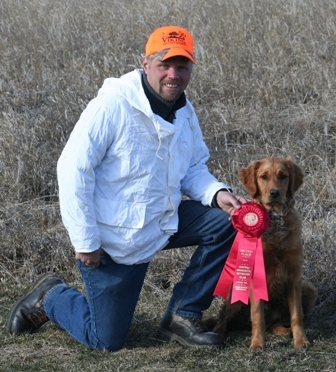 She ended up getting her CKC Sr. Hunter Title and her NARHA Working Dog title. Each title required 4 days of passes and she passed all 8 of the tests with no fails. A few of the days were very challenging and she was the only dog that passed. Considering how many different variables that we saw during those tests between the double marks and blinds, we were just so impressed that she was able to adapt to each situation and get it figured out. She really is very close to being able to complete the Master tests however we're going to hold off until next summer. We want to be sure that she is completely ready for the many diversions that will be thrown in Master's and there's no need to rush it. Sarah and I had a blast going around to all the different tests this summer and meeting a lot of great people. However, it's funny how nervous I get on that line before a test.... I complete some very stressful deals at work but none seem to get me as nervous as running a hunt test. By the end of tests this summer, I was feeling much more comfortable and hopefully a better handler for Stella. I've attached a few of our favourite pictures from the hunt tests this summer. 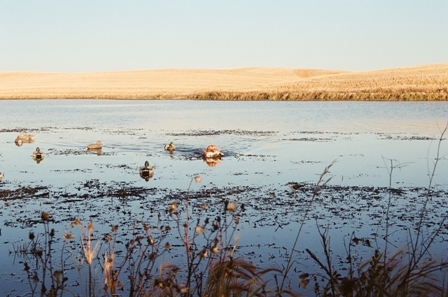 We're going to keep training through August and count down the days until Sept 1 (opening day of duck season)! Take care. 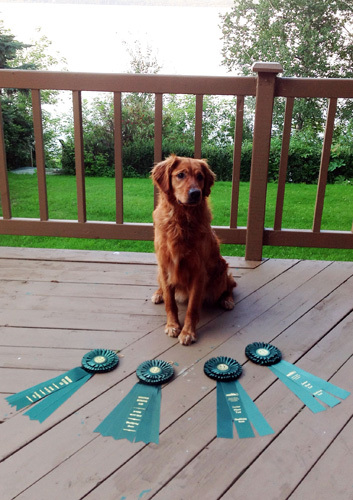 8/2012 - Stella earned her Junior Hunter title this summer with the combined handling of both Nick and Sarah! Congratulations to all of you, and we wish you well as you move to Senior! Stella came home to us in Dec 2010 and has completely changed our lives for the better. She has been a wonderful addition to our home. Stella is our first dog and is such a delight to have around the house, however when in the field, she transforms into a hunting machine! 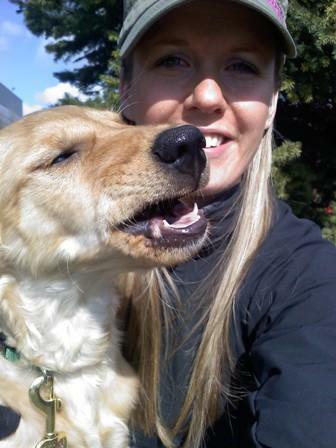 Stella was sent to a professional trainer and put through a three month gun dog program. 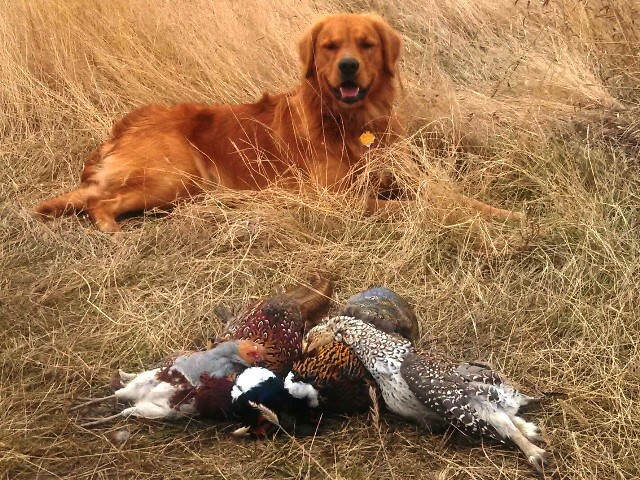 The trainer was very impressed with her bird drive mentioning that she was absolutely one of the best Golden's he had trained in years. 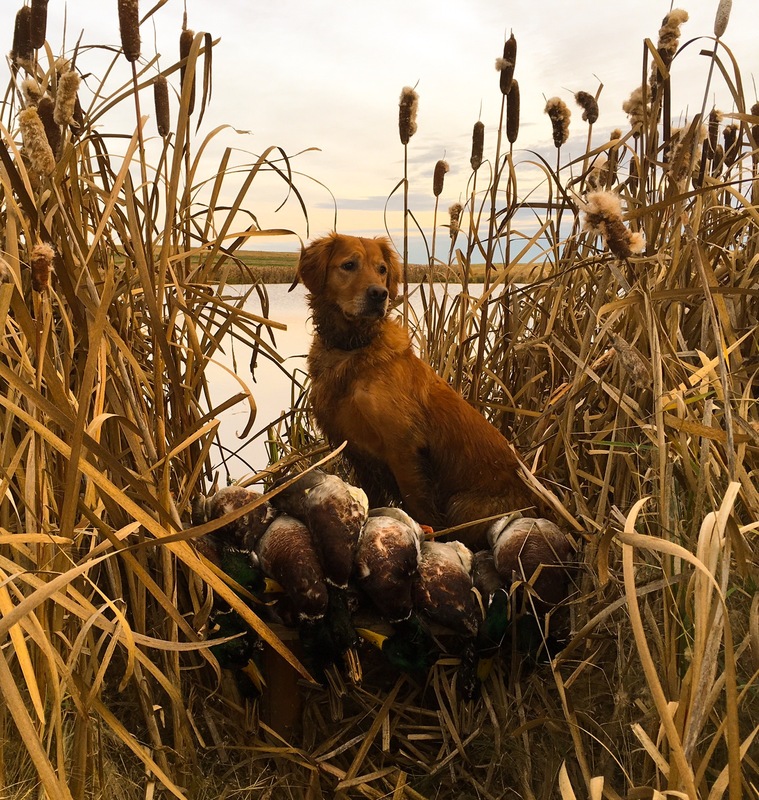 Coming out of the program, at 10 months of age, she was completely ready for her first hunt. 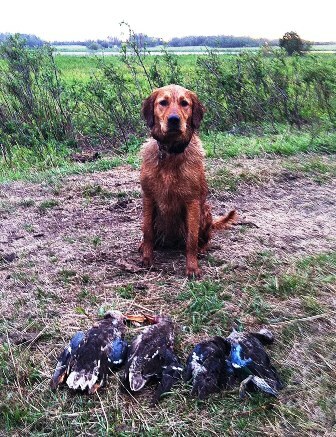 She excels at both upland and waterfowl. With myself, being a rookie in dog training, Stella has been a dream to work with. She catches on to new ideas so quickly. She is fearless in the field and any wounded bird doesn't have a chance of getting away. Her heart and determination to please never cease. 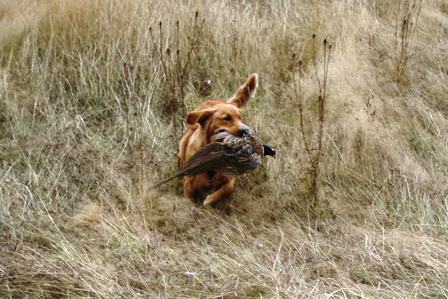 Stella has added a whole new dynamic to my bird hunting and recharged my enthusiasm for the sport. Being our first dog, we had many questions. The Flaments were wonderful to work with and provided support both before and after Stella joined us. Their years of experience in breeding are a great asset to a new puppy owner, as they are very quick to provide advice when asked. I can tell they truly care about their dogs and are passionate about their breeding. Our sincere thanks to Jill and Doug. Things have been exciting around here. From the pictures you can see Champ did well with his training. His good genes and intelligence made finishing him easy. Thanks for a great dog. He flushed three birds and retrieved two, only because we couldn’t shoot the third bird (it flushed behind a large brush pile). The kid in the photo is my nephew, he helped me with champs training when I couldn’t get around very well. 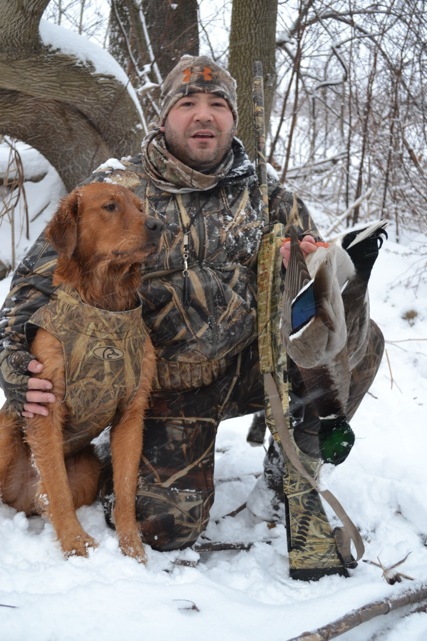 Plans are to pheasant hunt him for the next 60 days, then switch him to duck hunting for Dec and Jan.
We brought Whistler home on Feb 27th 2010 and from the moment we met her we knew this was a match made in heaven. She is so smart and eager to please. We receive comments frequently about her elegant appearance and her great behavior. We are so thankful to Doug and Jill for their assistance in picking out a puppy for us that matched our personalities and lifestyle. She loves the snow in winter and any body of water in the summer. She didn’t hesitate to jump into the water off the docks from the moment we took her near it. She would spend all day in the lake if we let her. She has been so easy to train, eager to learn more and looks forward to our training sessions. We plan to train her in obedience, possibly rally and we’d like to use her as a therapy dog. 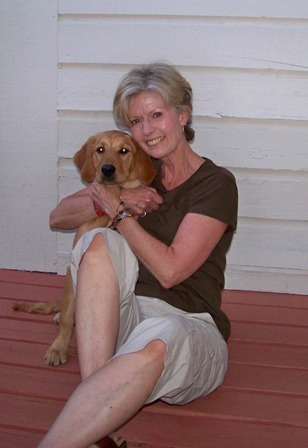 She is able to adjust her personality, even as a puppy, to meet the needs of her company. She senses that she needs to be calm and gentle around young children and the elderly. She adjusts to every situation we put her into with grace and confidence. We have been blown away at what a great dog she is growing up to be. 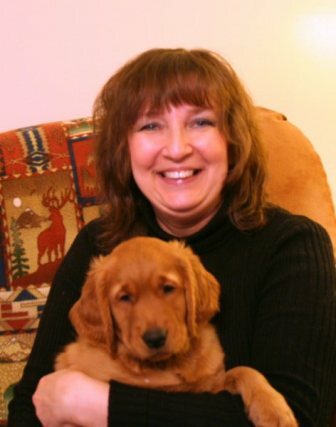 I am writing this while my 4 month old Annie/Finn girl-puppy, Maeve, is laying by my side happily chewing on a toy. She is a beautiful girl - as her glamour shots will reveal, but more importantly she has a fabulous temperament and personality. She is gentle and loving, smart and eager to learn, definitely bonded with me as her new "family" and yet also independent and confident. She gets along extremely well with other dogs and children and has acclimated to many different environments upon arriving in California with me. I've taken her to the university where I work, to a local outdoor mall, to dog parks and outdoor markets. At 4 months, she comes and heels perfectly, she sits and knows down, and she retrieves and drops - whatever she went for- on a dime at my feet. She is extremely attentive and learns any new command with great ease, usually with just 3 or 4 repetitions. Truly, it is amazing. We are working with a professional trainer so that Maeve will meet her first goal of getting certified by Therapy Dog International. We will then provide service through regular visits at a local childrens hospital and by working individually with children who have autism. 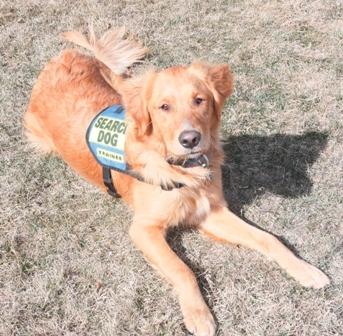 Along with therapy dog work, Maeve will train for competitive obedience and agility trials. My trainer, Sheila, also trains dogs for FEMA - for search and rescue; she has said there isn't anything Maeve couldn't do, if I choose to work with her in that venue. Most importantly, after recently losing my dog of 13 years, I have a new canine companion that I couldn't be happier with, and I am confident we are going to have a lifetime of fulfilling times together. This is all due, of course, to the careful and talented breeding and post-whelping nurturance provided by the Flaments. They take such good care of their beautiful dogs and begin a careful program of nutrition and neuro-sensory stimulation for the puppies shortly after birth. It's this extra attention, I am sure, that produces such fine, enjoyable, and trainable pups. 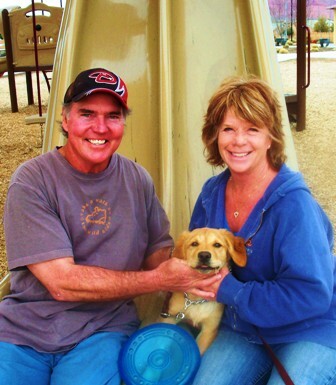 Both Jill and Doug were a joy to get to know before getting my pup and since! We swap puppy stories on a regular basis and they have always been available for any question I might have. You just couldn't ask for a better breeder to work with! 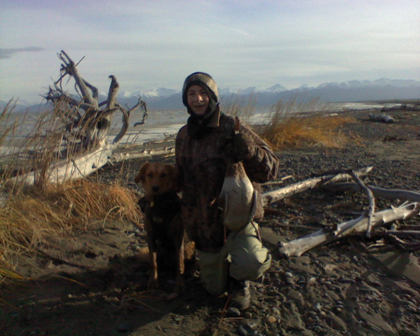 Well our little Benelli (we call her Elli) is almost a year old and we thought that you might enjoy some pictures of her Alaskan adventures. She has integrated into our large family and active lifestyle wonderfully. Whether we are on the soccer fields, the duck flats or on a mountainside, she is right in the middle of the action as kid #6. She loves to hunt for birds and will chase even a feather for miles. 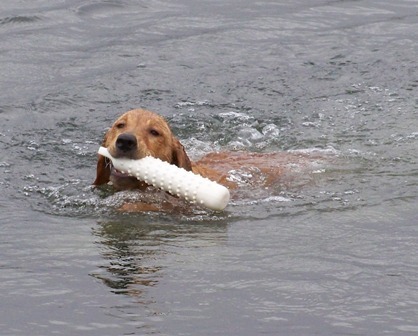 She has retrieved ducks in icy ocean waters, but prefers hunting grouse and ptarmigan in the woods and mountains. She is also a great fishing companion. 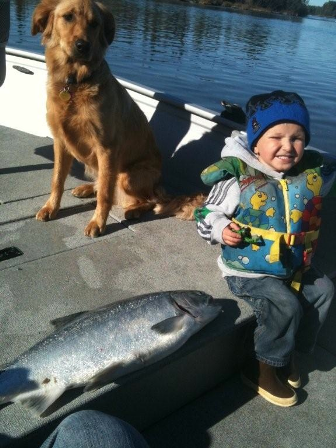 She gets more excited than the kids when a halibut or salmon comes alongside the boat. 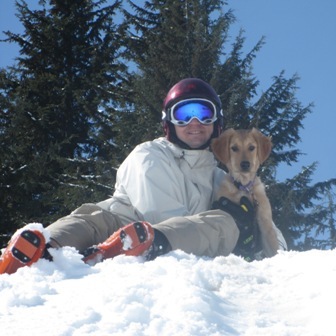 Elli is our second Golden and is a far superior dog than our first. She has more drive to hunt and has not had any of the health issues that plague our other dog. Thank you for providing a quality breeding service, we couldn't be happier. 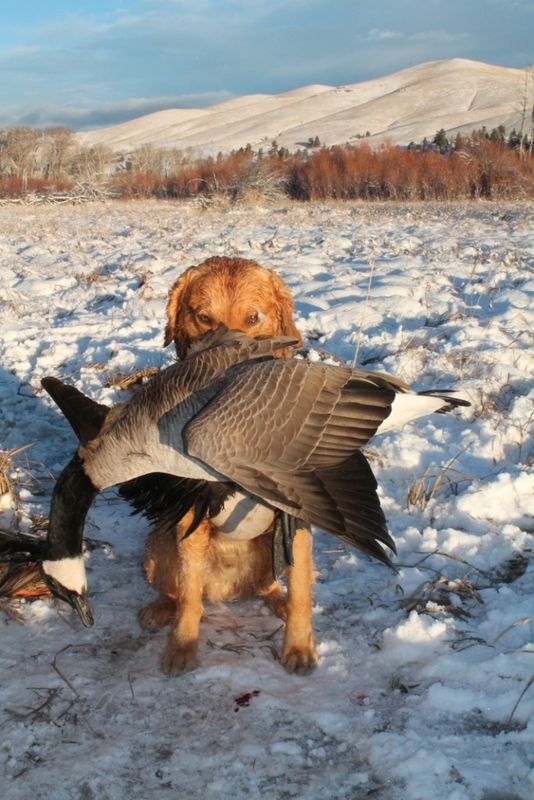 We made the feathers fly hunting over our Maci pup this season. 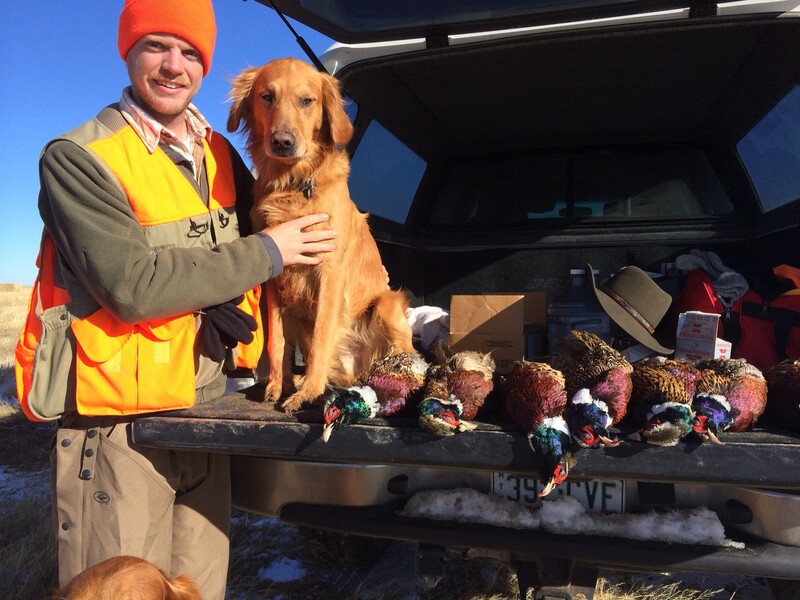 58 pheasants, 22 sharp-tailed grouse, and 3 huns, and she only lost a single crippled bird. 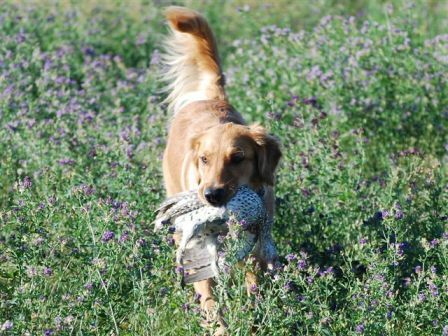 She's a fantastic upland bird dog. This is my Maci report. 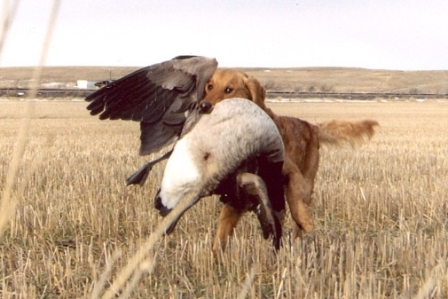 I think this pup can be a really good bird dog. She has lots of drive, never tires, even as a pup. She uses her nose as her sense of choice; she could easily trail a line of feathers buried in the snow. She naturally "hunts", searching cover, and casts downwind to get scents. 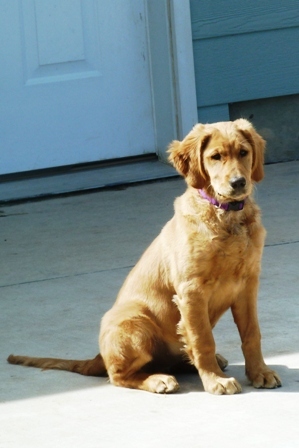 Maci is a very outgoing dog; she's fearless about new things, loud noises, machines and the like. 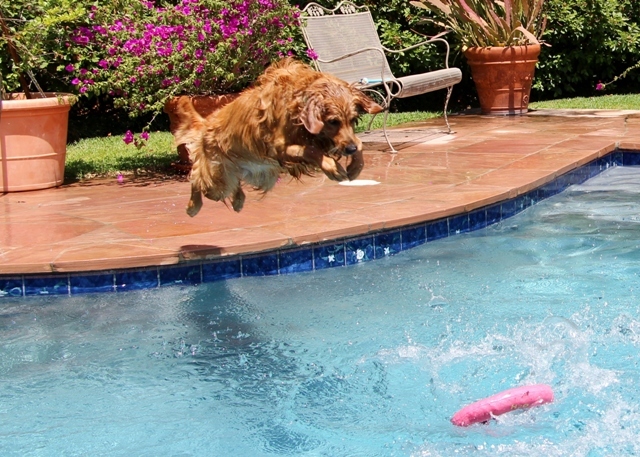 Maci loves the water; sometimes pups need to take it gradually, but not Maci. This is a very smart dog, good at problem solving. Maci works the cover well, back and forth, and does it naturally without being taught to do so. She retrieves the bird well, grabs it and brings it to me and doesn't mess around. She's had a couple of live birds and she handled them well. She's scary fast with amazing aerobic capacity, so she'll hunt all day. She trails birds well. She has a nice coat and it sheds burrs well. 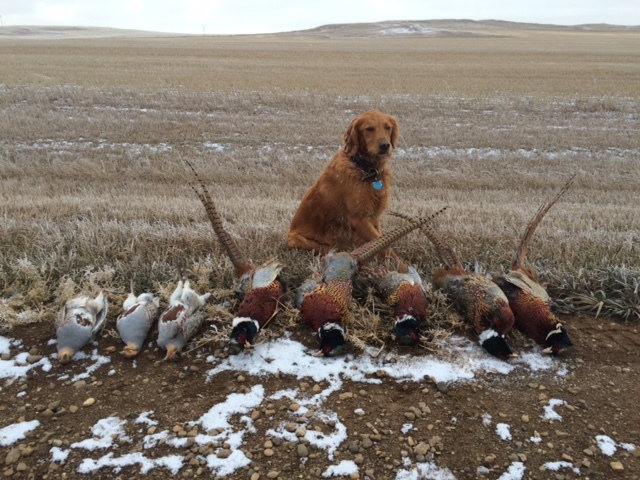 Now that we have been out pheasant hunting I can say that Maci does what she was meant to do. 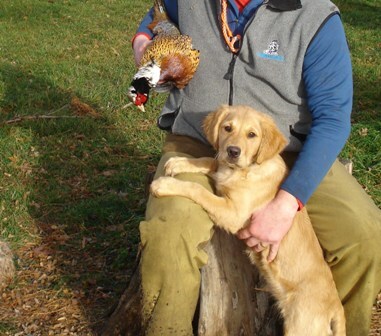 She's going to be a terrific pheasant dog! Kai is a little tracking machine. We spent 2 weeks in June at Tracking/Cadaver seminars and this weekend he will be learning how to search for drowning victims from a boat. Love him, he is the best dog. 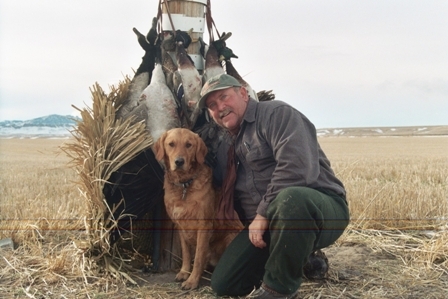 Saturday Night Golden Retreiver kennel has great hunting dogs!! 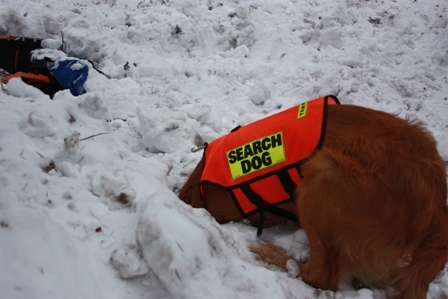 It is this desire to hunt that we put to use in the world of Search and Rescue. This last Thursday (April 1st) Saturday Night Kai (rhymes with guy) went on his first search mission. 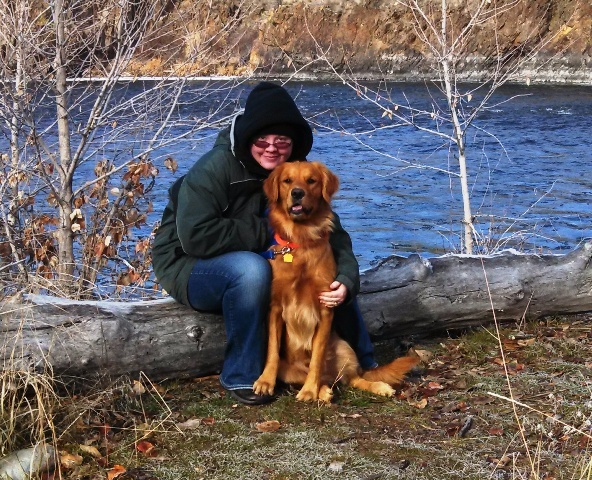 A missing woman in the foothills above Idaho Falls. Kai was not a participant but an observer. 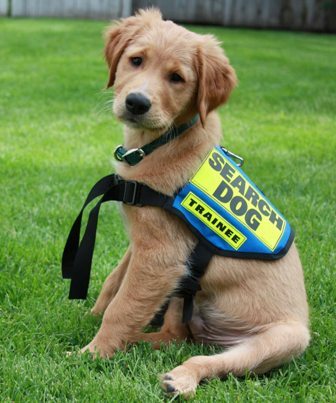 Kai at age one is being trained in tracking and cadaver, this summer he will start water training (for drowning victims). Next summer we plan on being certified and start searching on our own. What a great dog, thanks to Jill and her help, a couple of years from now we plan on coming back to Saturday Night Goldens for our next puppy. Thanks again. Gus is the third golden I’ve had over the last 40 years. 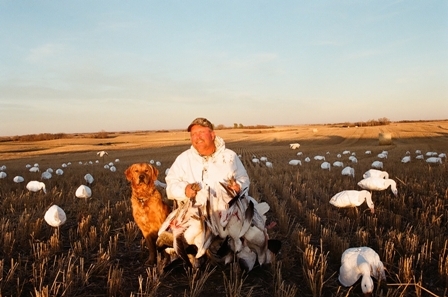 All were hunters and pets that brought great pleasure to our family. Gus is fitting in the same mold nicely and from the time we brought him home we’ve been picking up his retrieves. Anything that isn’t too heavy is brought to hand. 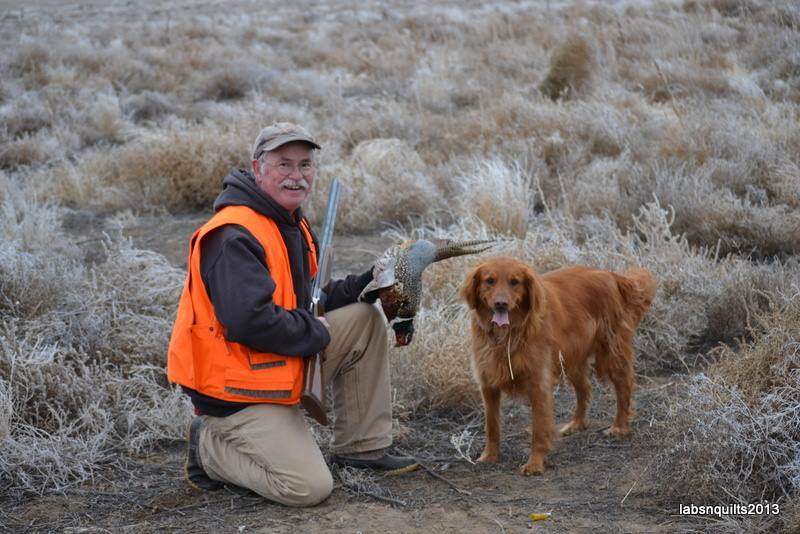 Gus and I were invited on an eastern Oregon pheasant hunt in mid December. 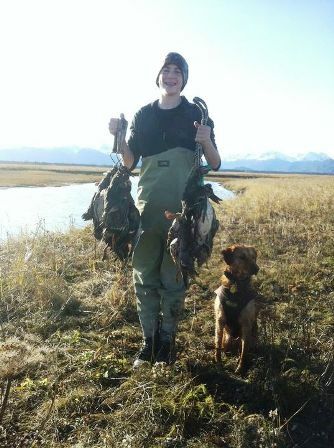 I had concerns about him being too young (3 ½ months) but we were hunting private property with experienced hunters and dogs so we accepted the invite. Gus’ natural instincts kicked in right away and he worked hard in the field (with several puppy naps during the day). 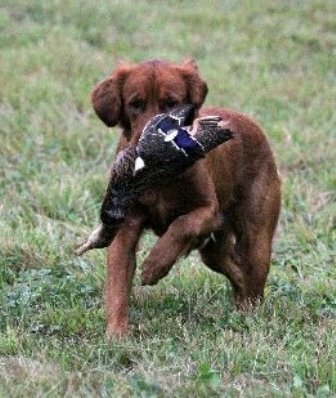 On the second day he got up his first rooster and went for the retrieve. Unfortunately he couldn’t get the bird in his little mouth – we called it good anyway. Although he is a very serious hunter, he has a lovely disposition around everyone – young and old. 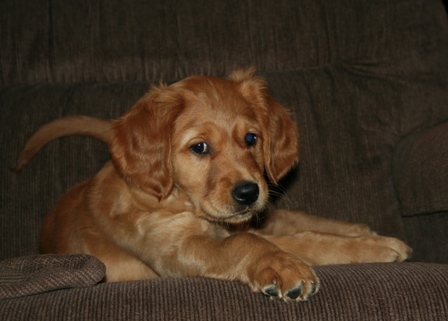 When we started looking for a golden puppy a year ago we found it to be a very frustrating experience. We were looking for a pet as well as a hunting companion. Most of the breeders we looked at were breeding show dogs and the dogs didn’t have the outdoor spirit we wanted. 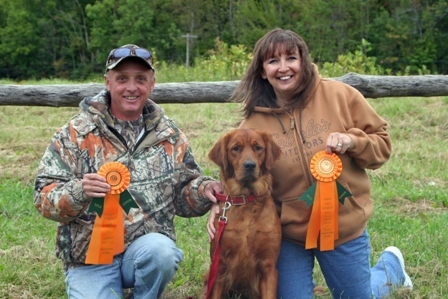 Jill and Doug were referred to us by a hunting friend who said that Saturday Night dogs were performers. Boy was he right. Gus was a perfect traveling companion on the 15 hour drive home (49 days old). He is a real treat in our house and gets along great with an old lab and an aggressive cat. He is very smart and takes direction with a positive spirit. His strongest drive is to work and please – he certainly takes after his parents. We train as often as possible, usually 3 -5 days a week and he hates when a session ends. Our thanks go out to Jill and Doug (and Babe and Finn) for making it a great experience and for producing a wonderful pet and best friend. 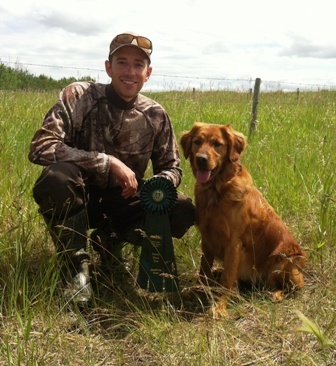 May 16, 2015 - Update - Bailey is now a Master Hunter! 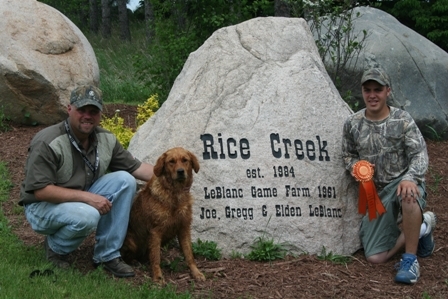 She earned her MH at the Rice Lake Hunt Test with Benita handling. Congratulations to both Benita and Bailey! 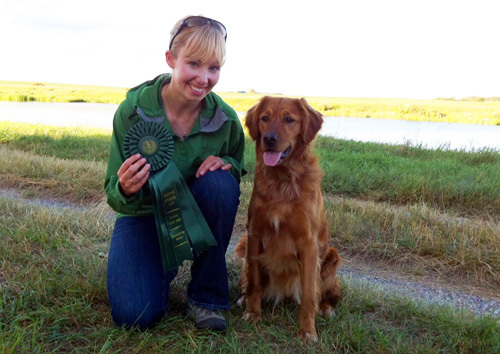 9/10/12 - Bailey passed her final leg for the Senior Hunter title at the GRCA National Specialty! 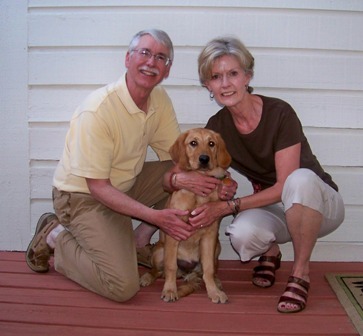 A Huge Congratulations to Benita and Todd for their hard work and success with this beautiful young dog! Just thought you might like to know Bailey got her first two legs for her Junior Hunter this weekend. Those were her first tries and she was able to pass on both, so we were pretty excited. We want to get the junior hunter and then start running Derby instead of the hunt tests. It was good for her to get practice and have the experience on the line. She hadn’t had any birds that were shot fresh in the air before, so she wasn’t quite sure about them at first! She has a lot of drive and style. Because we wanted to find a field trial dog and possibly start our own kennel , we were really careful about our choice. After a lot of hours researching bloodlines and looking for the right golden for us, we decided on Saturday Night Golden Retrievers. Jill and Doug have definitely done their research and have spent the time and money to establish excellent breeding lines, ensuring the longevity of the breed. Saturday Night Goldtop Baileys Comet (Bailey) is a loving, people crazy pup. Since we drove home with her in the car for 11 hours she has been a lot of fun and not too much trouble. She adjusted quickly to our family and got along well with our other pets, of which she quickly could out think our 4 year old miniature dachshund and our 8 year yellow lab. She has been easy to train, and we have started entering her in field trials. Considering she hadn’t seen grass until a week before the trial, she did very well and we are eager to keep her competing. Jill and Doug have definitely established their kennel to produce pups that will meet a variety of needs and be ready to quickly become a part of your family. 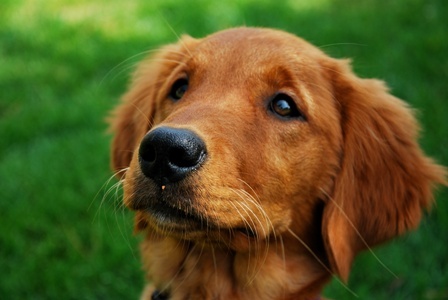 After much research on the internet, we contacted Saturday Night Golden Retrievers. Jill was great, and answered all our questions. We still have the phone message when she called and said she had a male puppy available for us. It was our lucky day! We fell in love with Tucker from the first picture we saw of him. Jill was great and kept us updated with pictures and videos of Tucker until it was time to take him home. It meant so much to see his weekly progress. 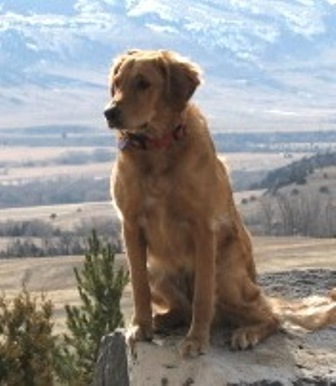 When Tucker was ready to come home, George flew from our home in Stuyvesant, New York, to Billings, Montana. Doug was good enough to deliver Tucker to the airport for his long journey home with George. He did so well on the plane that people did not even realize that George had a puppy on the plane with him. From the moment he came into our home, he became a loved member of our family. He and our other two goldens are the best of friends. Tucker is a beautiful puppy. He is very smart, and is easy to train. Tucker is almost seven months old now and is a big boy- he weighs 70 lbs. He looks just like his dad, Finn. 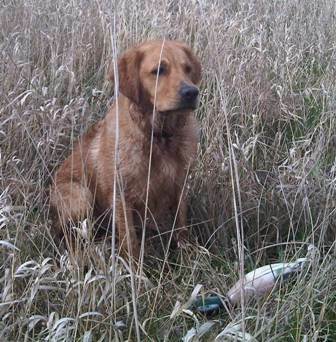 We have joined a retriever club, and are training Tucker for hunt tests. So far, he is doing great- he has the drive of a good retriever, and we are very proud of his progress. We believe this is the result of Saturday Night Golden's breeding. 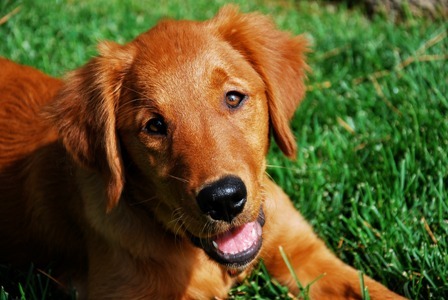 We would recommend Saturday Night Golden Retrievers to anyone who is looking for a high quality, beautiful golden. Thanks Jill and Doug for everything! 3-10-10 Here is a photo of our Saturday Night Miss O'Sarah. She was born March 17, 2009 to the Annie/Solo litter. Our Miss Sarah is perfect!! Besides being beautiful, she is also very intelligent. And we know this because she had us trained within a couple of months! Sarah is such a wonderful companion and she keeps us very entertained. 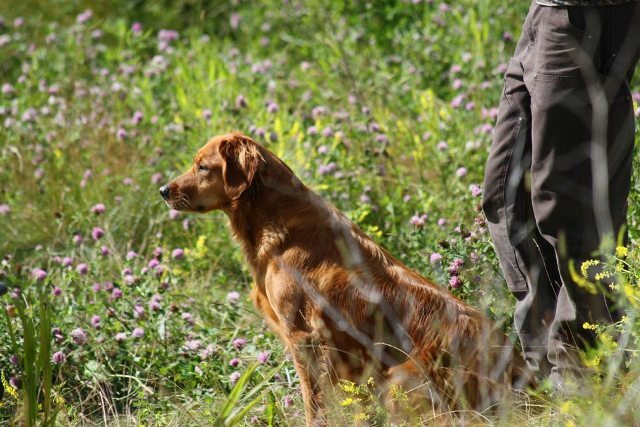 We don't hunt but Sarah loves to pick up scents around the property and is fascinated with birds. I know she would be excellent at hunting because she is so bright and willing to please. We are hoping that someday she might find "gold." After all, she is a Golden Retriever!! Doug and Jill have been wonderful at sharing advice and support this last year. We hope to get a sister for our Sarah in the near future and wouldn't think of going to another breeder. Thank you Doug and Jill for our precious Miss Sarah!! Oh yes, she is a little bit spoiled...and oh how we love to spoil her! We researched different lines of hunting golden retrievers but were most impressed with Saturday Night Golden Retrievers. dogs. Job well done Flaments!! Uncle Ed would be proud of Sadie!! 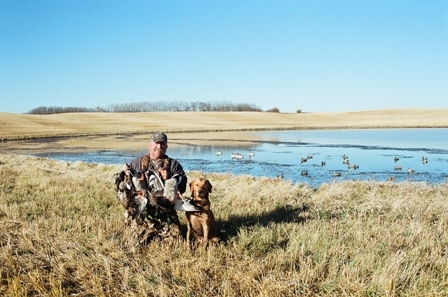 I updated my hunting journal and noted that Teal's tally for his second season was 101 birds retrieved and no birds lost! Pretty darned good for a second season 17 - 21 month old puppy. Attached a px - pretty proud of the goose retrieving shot. Will send a few more you might enjoy. I have been thoroughly pleased and somewhat awed by this Teal dog. He was born March 17th, 2009, and I picked him up the third week of May. He readily adapted to crate training and house training. He has from day one displayed a strong urge to retrieve, a good nose and keen eye, and a desire to learn. 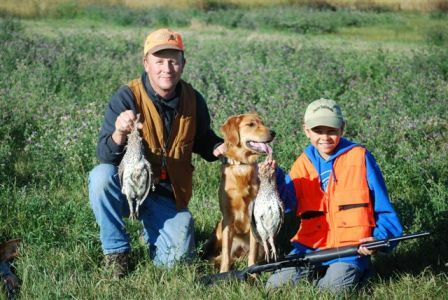 We opened bird season on September 1, when Teal was 5 1/2 months old (younger than I would normally start a dog to gun - but he was ready). We flushed a big blue grouse and at my shot, the bird dropped, and Teal retrieved that big grouse (the first bird he'd even been exposed to) as it he'd done it all his life. No hesitation, no ruffling of feathers - just "here you go." He retrieved 2 other grouse that day. 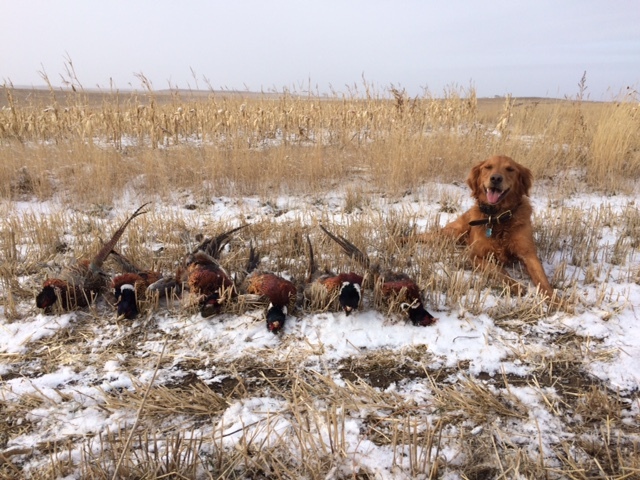 We ended the bird season on January 15, when Teal was just shy of 10 months old, with Teal retrieving 2- 14 lb Canada geese and 2 ducks from the Missouri River. 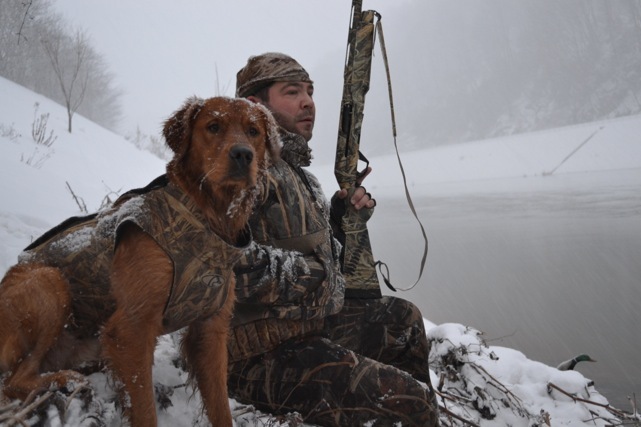 I checked my log book and my log shows that Teal hunted with me 31 days, and retrieved 46 birds, in his first season - no birds lost, and several birds retrieved that were still very much alive. 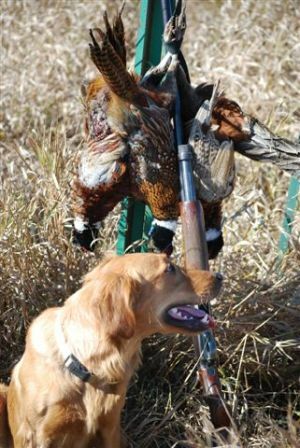 His season included hunting and retrieving blue grouse, ruffed grouse, sharptailed grouse, hungarian partridge, pheasants, geese, and ducks. He has a wonderful water entry, showed no reluctance to hit icy cold water, and showed no reluctance to push cattails, buckbrush, snowberry, or willows. Teal is a very social dog - curious about everything, very alert, and very friendly. 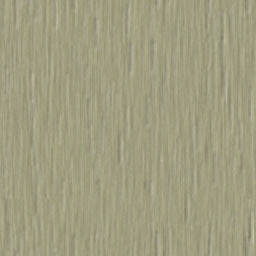 I have been very pleased with the Flaments and with their kennel. 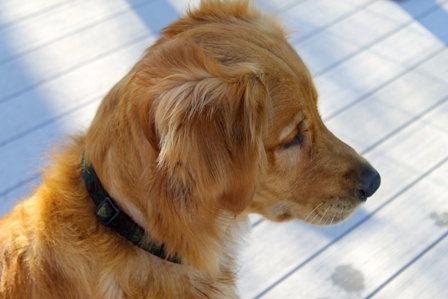 I learned of them through research, as my 7-year-old golden was sick and I knew I'd be losing him. Jill and Doug were very open with me, answered all of my questions, and are very personable people committed to their dogs. Their kennel is immaculate, and their care of their dogs is self-evident. I would not hesitate to purchase another dog from them, or to recommend them as potential breeders.